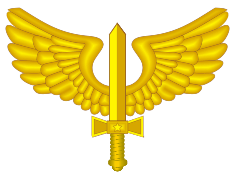 The Brazilian Army Aviation Command (Portuguese: Comando de Aviação do Exército) is a component of the Brazilian Army containing the army's helicopter units. The task of the Brazilian Army Aviation Command is to provide organic airmobility and support the ground forces by providing tactical air support, close air support and reconnaissance. The origin of the Brazilian Army Aviation lies in the Paraguayan War, with on the one side Brazil, Argentina and Uruguay (the Triple Alliance) and on the other Paraguay, when the commander-in-chief of the Brazilian forces, Duke of Caxias, deployed observation balloons in the field to observe the enemy troops. One of the first army aviators was Ricardo Kirk during the Contestado War 1912–1916, using monoplanes to support ground forces. These missions were predominantly flown for reconnaissance purposes. In 1941, upon the creation of the Aeronautics Ministry and of the Brazilian Air Force (FAB), Military Aviation, which was the name of the army branch that operated the aircraft, ended its operations as all flying tasks brought under the aegis of the Brazilian Air Force. In 1986, however, it was re-established under the name of Army Aviation to operate helicopters in support of the Brazilian Army. Army Aviation aviator badge 1988. Army Aviation Command also operates and maintains the infrastructures of the Taubaté Military Airfield, thus guaranteeing the aeronautic activity of the units. 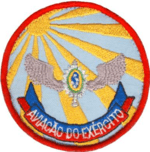 The 4th Army Aviation Battalion, based in Manaus, uses the aeronautic infrastructure provided by the Brazilian Air Force Manaus Air Base.